Through years of laboratory and pilot scale effort, CalciTech has perfected a unique and patented process that allows microscopic calcium carbonate particles to be synthesized with unprecedented purity and consistency. Due to the fundamentally different nature of the CalciTech process and product from existing PCC materials, the company has named the new material "Specialty Calcium Carbonate" or "SCC". Most remarkably, this superior form of synthesized calcium carbonate can readily be produced from inferior, by-product and waste raw materials. Virtually any material that contains significant amounts of calcium oxide and/or calcium hydroxide can be used as a raw material for the manufacture of SCC by the CalciTech process. The core of the CalciTech SCC process involves the use of a proprietary chemical agent (known as a "promoter") that greatly increases the solubility of calcium oxide and/or calcium hydroxide (and ONLY these materials) in water. As shown in Figure 1, the calcium containing raw material is treated with the promoter and calcium oxide and/or calcium hydroxide is selectively dissolved into solution. The insoluble (non-calcium) materials are then completely removed via solids separation techniques, and the crystal clear solution of Ca(OH)2 and promoter is then transferred to a carbonation reactor. At this point virtually all non-calcium materials have been removed from the reactants. A CO2 containing gas is then introduced into the reactor in a fashion similar to the conventional PCC process. However, unlike the PCC process where the dissolution of solid calcium hydroxide introduces both a rate limiting step and a source of PCC crystal variability, in the SCC process all the calcium is already in solution awaiting reaction with the CO2 gas. The carbonation step, therefore, goes swiftly to completion and SCC crystals of outstanding uniformity and purity are produced. The SCC product is then dewatered and washed to remove the promoter. Depending on the intended end use, the SCC may be concentrated and dispersed to a 72% solids slurry (if, for instance, paper coating is the intended application) or it may be processed further via drying and milling (if, for instance, it is intended for use in polymer, food or pharmaceutical applications). After suitable reprocessing, the promoter is recycled back to the beginning of the process and reused to solubilize additional calcium oxide/hydroxide from the incoming raw material. The CalciTech process is capable of producing a variety of SCC particle sizes depending on the process conditions used. 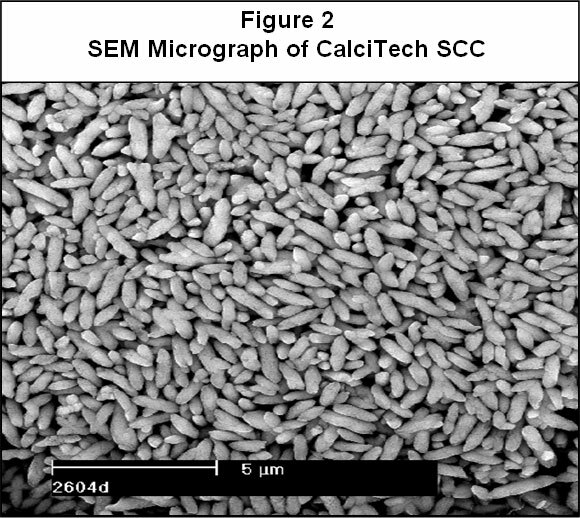 As shown in Figure 2, the prime product currently undergoing commercialization is a rice shaped, discrete calcite morphology with an average particle size of about one micron and a very narrow particle size distribution (as measured via the Micromeritics SediGraph instrument). The extreme uniformity of the SCC crystals is evident in this scanning electron microscope (SEM) image. Extensive applications testing has shown that this crystal morphology makes the most effective use of each SCC particle and produces an outstanding balance of properties and processing in such diverse end uses as paper coating, polymer filling and food and pharmaceutical formulations. An additional advantage of CalciTech SCC is its extreme chemical purity. The removal of virtually all non-calcium contaminants prior to carbonation not only allows use of impure raw materials, but also produces a calcium carbonate product that meets and exceeds all food and pharmaceutical purity requirements. Even magnesium, a close chemical cousin to calcium that is present in significant quantities in all PCC products, is virtually absent from CalciTech SCC. The outstanding purity of CalciTech SCC results in a product with very high whiteness and brightness and extremely low abrasivity. Table 1 below shows a quantitative elemental impurity analysis for a typical SCC that was carried out at the Analytical Laboratory of the Geneva Institute of Technology using an ICP-MS instrument. The extremely low levels of such problematic elements as lead and arsenic make CalciTech SCC a very attractive material for use in food and pharmaceutical applications. The single largest expense in the production of PCC by the current commercial process is the high quality, virgin quicklime that must be used as the calcium raw material source. For this reason, the ability of the CalciTech SCC process to use impure, by-product raw materials offers a significant process cost advantage. In addition, the need to calcine limestone in order to produce "fresh" quicklime for production of PCC results in an overall addition of CO2 to the environment for every ton of PCC manufactured. The CalciTech SCC process, however, requires no new quicklime to be produced. Therefore, the recycling of waste materials into high quality SCC leads to a truly "green" end product, whose manufacture results in the removal of 44 tons of CO2 from the atmosphere for every 100 tons of SCC produced.